Product prices and availability are accurate as of 2019-03-30 10:49:44 EDT and are subject to change. Any price and availability information displayed on http://www.amazon.com/ at the time of purchase will apply to the purchase of this product. 6" diameter. 1000 Plates . 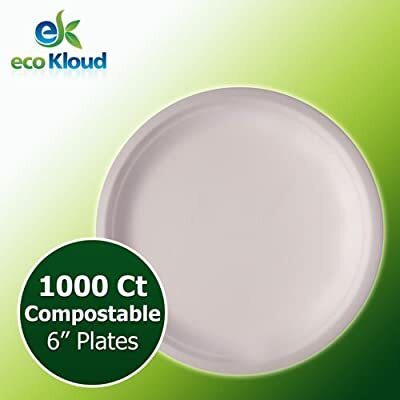 Tree free, best alternative to paper, plastic and styro-foam plates . Compostable . Environmentally friendly. Safe for Hot and Cold food items. Microwavable and Refrigerator safe. Soak Proof and Oil Resistant. Strong, no need to double up. Upscale Sustainable Dinnerware. Natural White surface provides brilliant, exterior appearance. Recommended to be composted at commercial composting facility. Check to see if appropriate facility exists in your area.